Siriki Dembele celebrates his goal for Posh at Burton. Photo: Joe Dent/theposh.com. Dazzling Peterborough United winger Siriki Dembele is determined to become a complete footballer. The 22 year-old is earning a huge League One reputation for speed, trickery and quality goals - he claimed his fourth of the season in yesterday’s (October 27) 2-1 win at Burton - but he’s also busy working to improve the other aspects of the modern day wideman’s role. Dembele linked up well in defence and attack with Posh Football League debutant Tyler Denton down the left side at the Pirelli Stadium. “Of course I enjoy scoring and creating goals,” Dembele told the Posh website. “But I’m also trying to help out defensively. “Tyler Denton was fantastic. He helped me out no end. He spoke to me throughout the game about how he wanted me to help him out and it worked as we saw out a difficult game very well in the end. “I was pleased to score of course. It was a great pass by Joe Ward to send me through. I was going to chip the ‘keeper, but he stood still so I went round him instead. Siriki Dembele of Peterborough United scores his sides second goal of the game at Burton. Photo: Joe Dent/theposh.com. “It was a great feeling to score in front of our away fans who were brilliant again. The incredible noise they make in away games is one reason we are doing so well away from home. “We played very well to get 2-0 up, but conceding so soon after my goal forced us to defend more against a very good side. It was Dembele’s first goal in seven games. He also struck the post in a man-of-the-match display. 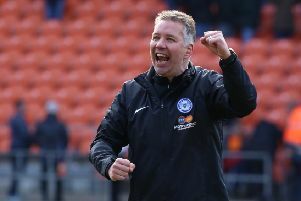 Posh have won seven out of eight unbeaten away games in League One this season. They travel to Wycombe for their next fixture on Saturday (November 3).